Another great competition from Hic Dragones… entry via the Rafflecopter widget below. A luminous and bewitching debut novel that is perfect for fans of Angela Carter. Set in Victorian London, it follows the fortunes of Eve, the Lion-Faced Girl and Abel, the Flayed Man. A magical realism delight. Before Eve is born, her mother goes to the circus. She buys a penny twist of coloured sugar and settles down to watch the heart-stopping main attraction: a lion, billed as a monster from the savage heart of Africa. Mama swears she hears the lion sigh, just before it leaps… and nine months later when Eve is born, the story goes, she doesn’t cry – she meows and licks her paws. When Abel is pulled from the stinking Thames, the mudlarks are sure he is long dead. As they search his pockets to divvy up the treasure, his eyes crack open and he coughs up a stream of black water. But how has he survived a week in that thick stew of human waste? Cast out by Victorian society, Eve and Abel find succour from an unlikely source. They soar to fame as The Lion Faced Girl and The Flayed Man, star performers in Professor Josiah Arroner’s Palace of Curiosities. And there begins a journey that will entwine their fates forever. Rosie Garland is an eclectic writer and performer, ranging from singing in Goth band The March Violets through touring with the Subversive Stitch exhibition in the 90s, to her current incarnation as Rosie Lugosi the Vampire Queen, cabaret chanteuse, incomparable compere and electrifying poet. 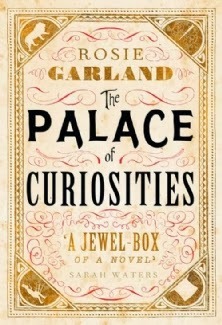 The Palace of Curiosities is her debut novel. Rosie’s short story, ‘Cut and Paste’ is published in the Hic Dragones Wolf-Girls: Dark Tales of Teeth, Claws and Lycogyny anthology. 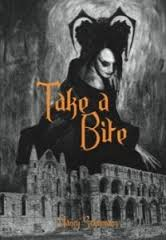 Take a Bite is a non-fictional text discussing female vampires in folklore and Anglo-American Literature and how their characteristics changed through the ages. Readers will find a concise introduction to female vampires in folklore of various regions; with specific focus on the Lilith and Lamia figures that later on feature prominently in art and literature and including an overview on the numerous superstitions and phenomena that gave rise to vampire belief around the world. Further chapters deal with the representation of vampiresses in literature and how this changed through the eras; starting with early romantic works such as Le Fanu’s Carmilla and Keat’s Lamia where the vampires is a strong, independent woman who does not fit into the patriarchal society. Dracula puts female vampires in an inferior position, as the count takes centre stage. The discussion of Dracula focuses on the character of Lucy Westenra as a woman misunderstood by many critics. The works of Tanith Lee and Anne Rice also include very interesting female characters. Anne Rice’s male vampires have been discussed excessively but her vampiresses deserve much more attention than they have received so far. The Vampire Diaries are conquering TV screens and with True Blood and Twilight vampires are all around us, but is there a vampire queen among them or are we all just lusting after Edward? Nancy Schumann completed a master’s degree in English Literature at the University of Leipzig, Germany. Particular research interests were Gothic novels, detective stories and women’s studies. Her MA thesis was on female vampires through the ages. The topic combines feminism and Gothic novels with her personal interest in fanged fiends. This formed the basis to Take A Bite, now available in vamped up form for public consumption. Nancy’s short story ‘The Hostel’ was published in the Hic Dragones Impossible Spaces anthology.